Passengers can choose from 60 regular airlines, connecting Prague directly to about 130 destinations around the world. The most popular airlines operating in Prague are Alitalia, Delta Air Lines, British Airways, easyJet, Emirates, Finnair, Germanwings, Iberia, Jet2, Korean Air, LOT, Norwegian, Ryanair, SWISS, TAP, Turkish Airlines, Vueling, and Wizz Air. There are five cargo carriers operating on a regular basis at Prague Airport, along with tens of other companies that provide charter flights. Prague Airport employs over 2,000 people, while over 15,000 are employed by companies operating at the airport or linked to its operation. The IATA (International Air Transport Association) airport code is PRG. Over one million passengers use the airport every month, which is approximately equal to the number of people living in Prague. Czech Airlines (ČSA) company, which is a member of the SkyTeam Alliance, is the major flight carrier of Prague Airport. The Airport has three terminals, two of them dealing with both international and domestic departures and arrivals, and the third one serving general and business aviation. Václav Havel Airport is located 19 kilometers west of the city center, and with over 10 million passengers a year is one of the busiest airports in the newer EU member states. The Association of IATA chose Prague Airport to receive the Eagle Award for 2011, meaning that the Airport was selected as the best developing one. According to an Airport Survey organized in 2015 by an independent airport travel portal, Prague Airport is in the TOP 20 best European airports (voted by travelers themselves). In 2012 the former Prague Ruzyně International Airport was named after the former Czech president Václav Havel, who had died the previous year. One of the most internationally renowned and adored Czech personalities, Havel was a writer, philosopher, dissident, and statesman, who deservedly became a symbol of the Velvet Revolution and the famous events that led to Communism being finally toppled in Czechoslovakia in 1989. It was the wish of the general public to name the airport after Václav Havel. The International Václav Havel Airport is situated in the northwest part of Prague, next to Kněževes and Přední Kopanina. The distance from the airport to the city center (Old Town Square) is around 16 kilometers and takes around 20 – 40 minutes depending on the traffic situation. The airport is, of course, open 24 hours a day, 7 days a week. The public transport to the airport (and of course from it, too) is covered by the buses of PIT (Prague Integrated Transport), completed with a special AE bus (Airport Express). You can, for example, take bus number 119 to Nádraží Veleslavín metro station, or bus 100 to Zličín metro station. Airport shuttle buses (by Cedaz) operate daily (including weekends and public holidays) from 7 AM to 7 PM, every 30 minutes. You can get on at terminal 1 (close to exit F) or terminal 2 (close to exit E). For one person, a ride to Prague’s downtown (street “V Celnici”) costs 150 CZK ($6.00) and takes about 30 minutes. You can get tickets from the Cedaz counter at both arrival halls, close to exit E, or directly from the bus driver. There is no need to reserve a space. Of course, you can always take a cab. Taxi service counters can be found in the arrival halls of terminals 1 and 2, and taxis are ready to be taken just outside of the exits. The official airport cab operators are AAA Radiotaxi and FIX Airport Cars, and it is best to use those because, unfortunately, Prague is infamous for its deceitful taxi drivers. Alternatively, you can use Uber or a different taxi company, which are cheaper but don’t have their own taxi spots at the airport. The price for the official airport taxi (AAA or FIX) is around 500 CZK ($20.00), or 360+ CZK ($14.50+) with UberPOP. OUR TIP To get from the Prague Airport to the city center we recommend using Welcome Pickups service. For the same price as a regular taxi (22€), you will get a private driver with excellent English and knowledge of Prague. The driver will be also waiting for you with the welcome sign at the terminal exit. Below is a live webcam feed of the runway at Prague’s airport, on which you can watch planes landing and taking off. You can also listen to the communication between the pilots and control tower. 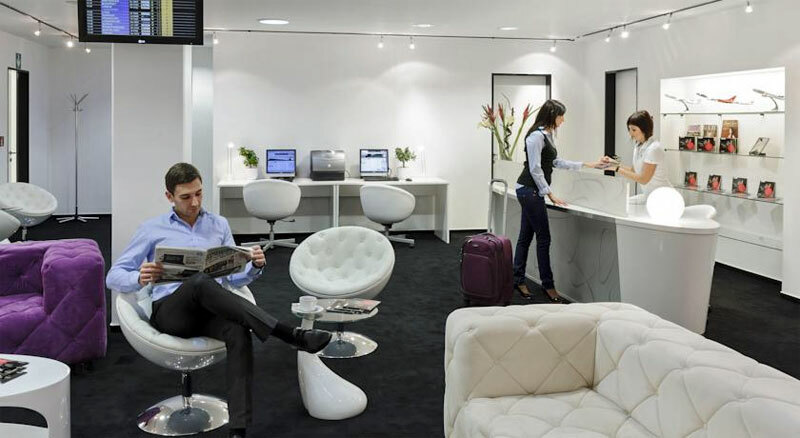 There are of course many services provided at Prague Airport, including among other things a Rest & Fun Center, for those waiting at the airport for a long time. This offers a mini-lounge, overnight rooms, an internet café with a PC corner, refreshments, a TV, DVDs, an Xbox and a shower. You can also take one of the Prague Airport tours, offering a “behind the scenes” view with the possibility to see full operation of the dispatch areas and learn about the runway system, or get close to various types of planes taking off and landing. Of course, there are also numerous restaurants, cafés, bars, and shops of all kinds, and many services are provided specifically for families with children. Activities for babies and children include, but are not limited to, merchandise for children, restaurants offering children’s menu, children’s corners, and rooms for parents traveling with children. These are all labeled with the Mr. B mascot so parents can easily find them. Prague Airport is also quite often the venue of various exhibitions and other events. These consist of displays of photos of the Airport’s history or public conferences on the topic of aviation, but also many other cultural events. All kinds of services usually available at top contemporary airports are of course also present and offered at Václav Havel Airport. These include currency exchange transactions, travel insurance, information services (about flights and also Prague in general), luggage packing, short- and long-term parking, free WiFi (SSID prg.aero-free), a post office, a pharmacy, car rental, mobile phone operator services, a smoking area (terminal 1, baggage claim area), a prayer room (terminal 2, departures), and pretty much anything you can think of that you might need at an airport. One of the most interesting and unique “services” at Prague’s airport is a piano. It is available to the public, and everyone can play. The Piano is located at terminal 2, gate D1. Below you can see the 12-year old Denis Szalbot in action. 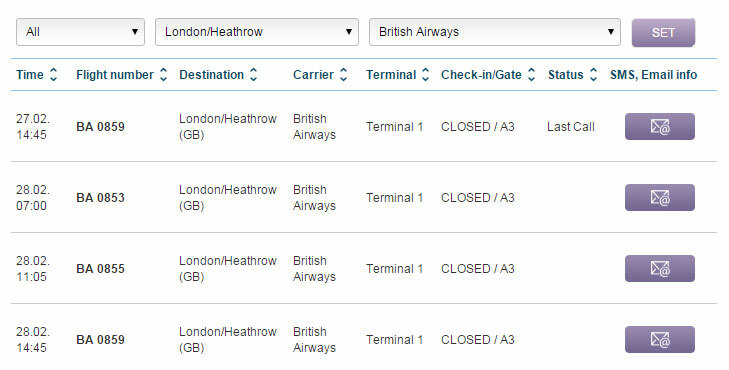 For monitoring flight arrivals and departures, we recommend using the airport’s official website. You can even set up free SMS or e-mail notifications for your flight. You can filter by time and date, destination, or carrier. There are three 4-star hotels close to the airport (Holiday Inn, Courtyard by Marriott and Ramada) and a Rest & Fun Center directly at the airport. Checkout time in all hotels is very convenient at 12 PM. The Ramada is the cheapest one, with a rating of 8.1 according to Booking.com, and prices of 2,300 CZK ($92) per night for a double room. Compared to the others, it is located a little far out, at terminal 3 which is 1.6 kilometers from other terminals. The room size is only 18 m². 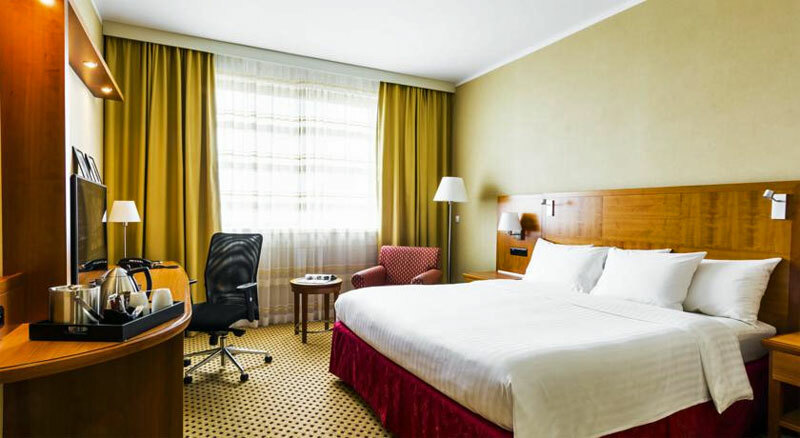 One night in a double room at the Holiday Inn costs 2,500 CZK ($101). The hotel’s rating is 8.4 and it is just 300 meters from arrival and departure terminals (walking distance). Room size is 25 m². The best and also most expensive option is the Courtyard by Marriott. The prices for one night in a double room start at 3,200 CZK ($129), but you can expect excellent service, as shown by the hotel’s 8.9 rating, and the closest location to the airport out of all three hotels, just 200 meters. Room size is 24 m². The final option is the Rest & Fun Center, operating directly by the airport. It is very cheap, as a room for 2 adults and up to 2 children start at 1,500 CZK ($60). The facility is located directly at the terminal 1, and at 8.6 the rating is very impressive. Room size is 23 m², but the big disadvantage is the early checkout at 8 AM. It also has only 9 available rooms, so is often fully booked.